I stumbled upon an interesting project by Doug Goodwin and Rebecca Baron, part of which was shown in the context of the workshop “Designing for Forgetting and Exclusion” at the UCLA Graduate School of Education & Information Studies, organised by Jean-François Blanchette (who was at our Media, Memory & the Archive conference last year). A few snippets from the introductory text on this workshop. “Today the rapid spread of information and communication technologies has been accompanied by a redrawing of the boundaries between the forgotten and the remembered, between that which is included and that which is excluded from the permanent record. As storage technologies have gained in practicality and dropped in price, the shift to an electronic medium has changed the default position from one of forgetfulness to one of remembering. The importance of this shift can be seen in recent policies that mandate that telecommunications operators, for law enforcement purposes, preserve data for increased periods of time; in technologies that, in order to provide businesses with sharp pictures of consumptions patterns and fraud, mine extended time series; and in the attention paid to metadata schemas whose goal is to increase the long-term value of these electronic memories. Baron and Goodwin’s Lossless project consists of a series of works that looks at the dematerialization of film into bits, exposing the residual effects of the processes that makes digital distribution possible. They used several methods to alter existing works, either interrupting the data streaming by removing basic information holding together the digital format or comparing 35 mm to DVD and examining the difference between each frame. The project considers the impact of the digital age on filmmaking and film watching, the materiality and demateriality of film as an artistic medium, as well as the social aspects of how the online community functions and the audience for such obscure films. 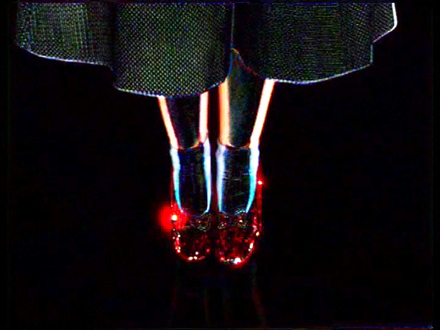 Lossless #1 (2007) is a 16mm film loop showing Dorothy’s shadowy, fluttering ruby slippers endlessly clicking. The image is derived using custom software comparing 35mm film frames against DVD compressed frames. in full Technicolor as it was shown in 1939. But the truth is that we’ve only seen it on television. Now that we may buy the digitally enhanced DVD and watch the ”Wizard of Oz” on our laptop computers, we wanted to know exactly how the media had changed. By capturing the differences between a 35mm print and a digital version, Lossless shows exactly what has changed. We started the project by looking for the best and worst versions of ”The Wizard of Oz.” We soon realized that it would be impossible to secure the best version. In the meantime they have produced other versions. 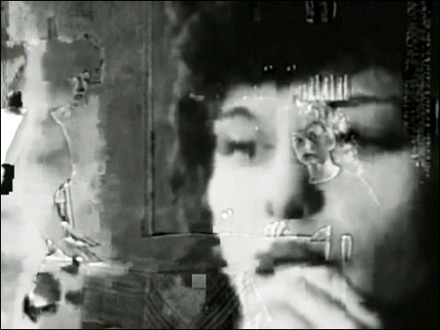 Lossless #2 is a three-minute video constructed from a bit torrent file of Maya Deren’s Meshes in the Afternoon in the process of being downloaded. 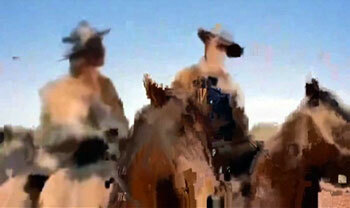 Lossless #3 is a video in which missing keyframes from a clip of John Ford’s The Searchers turns the American West into a melting ribbon of ochre and rust. Lossless #4 is an animation showing the motion vectors that propel blocks of color between keyframes in Ernie Gehr’s structuralist piece Serene Velocity. Lossless #5 uses some of the same techniques, applied to a Busby Berkeley extravaganza. More info on Doug Goodwin’s site. I’m sure some of these experiments might turn up in one of our programs, sooner or later.